Have you ever considered how much of your health depends on your diet—whether it’s healthy or unhealthy? The things you eat—or if you even decide to eat at all—can directly affect how strong your smile is. Your dentist in Waverly, Dr. Jonathan Smiley, wants patients to pay attention to what they put into their bodies, and how even holding back from eating can deteriorate your mouth. Let’s take a better look at the nutrients you need for a healthy mouth and what will happen if you avoid them. High fiber foods are some of the best foods for your smile. Their crunchy nature naturally scrubs your teeth free of debris when you chew and simultaneously creates stimulate saliva flow. Creating more natural saliva is beneficial to your teeth because it neutralizes acids, contains natural calcium, and even embodies natural phosphates that help rebuild minerals that keep your smile strong. Dr. Smiley recommends that you eat high water-level foods like apples, carrots, and crunchy celery to naturally clean plaque off your teeth. These healthy foods also keep your breath fresher for longer periods of time. Water is one of the best substances for your whole body hands down, but it’s especially important for a healthy mouth. It’s the primary component to saliva, which is important in keeping your teeth and gums healthy. Water also keeps your mouth hydrated so you don’t suffer from the effects of dry mouth or develop chronic bad breath. Not to mention, you can drink fluoride-enriched water to strengthen your tooth enamel! Snack on peanuts to increase your levels of calcium and vitamin D. Almonds are also full of calcium and cashews stimulate natural saliva flow. Walnuts are one of the best nuts to pack in your lunchbox. They have the highest amounts of fiber, folic acid, iron, thiamine, magnesium, iron, niacin, vitamin E, vitamin B6, potassium, and zinc. Do you need help keeping your teeth and gums strong? Have you been more self-conscious about what you eat? 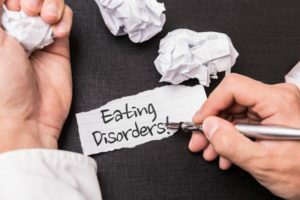 Before an eating disorder gets out of hand, the best thing to do is make an appointment with your dentist to begin effective rehabilitation both for you and your smile. Our office can stress the importance of their teeth, maintaining a healthy diet, and reach out to more resources they may need. Contact us today!